Positive momentum continues to make impactful changes in the Rhode Island market. The office sector is no longer a tenant’s market, quality industrial sales have occurred leaving much demand on the market and new residential construction continues to be added. With residential conversion at a high, idle office buildings are being purchased. Stagnant areas are being invested into and the flurry of activity would only show a slowing due to low inventory. Demand is at a high as companies continue to make meaningful changes for efficiency, investment and growth. As many Class-B office spaces in downtown Providence have been converted into multifamily housing, there is beginning to become a lack of good quality Class B spaces. Some owners/investors are now in a quandary over whether to keep the space as office or to convert to residential. There has been little new construction for office spaces, with the exception of the Innovation Center by Wexford. Market rents seem to be stable, with the only true upward pressure being in the Class A buildings. This is believed to be caused by the absorption by the change to residential and the downsizing of firm sizes which is happening simultaneously. These changes are keeping rental rates steady but not creating demand. All of these projects are located in fringe downtown locations in close proximity to transportation or educational uses. In downtown, 78 Fountain St., a $52 million project that received about $6 million in state economic development incentives through the Rebuild Rhode Island program is in the pre-construction phase as it demos a small building on Fountain St. This project, titled the Nightingale, is being done by Cornish Associates LP and Nordblom Co., the same partners that recently purchased and redeveloped the Providence Journal Building, which now houses GE and Virgin Pulse as major tenants. The plan includes 143 apartments and about 7,500 s/f for retail and a grocery store. In the Jewelry/Innovation District, the Chestnut Commons recently broke ground in early October. The $33 million project is a six story building with 92 apartments and 6,000 s/f of retail space on the ground floor, which is being developed adjacent to the 95 Chestnut residential conversion. There is a lack of industrial construction in the market. While there have been quality industrial sales that have occurred, the desired properties are under contract almost immediately leaving the less desirable spaces to be picked over. This trend has pushed the price per square foot to climb but given the current inventory we may see that level off as the year closes out. There is a vacancy factor of less than 4% statewide in the industrial market. Rental rates for industrial properties still aren’t high enough to justify new construction throughout a majority of the state. Recent quality sales include: Providence Water purchase of the 180,000 s/f, former Bank of America call center at 125 Dupont Dr. in Providence; a 25,000 s/f high bay warehouse at 25 Slater Rd. in the Howard Industrial Park in Cranston; and the sale of the 90,000 s/f mill at 1110 Central Ave. in Pawtucket. Quonset Point continues to be a success story with QDC developing new flex space which should help to meet some of the demand in the market. While Greencore remains vacant, there is an ongoing effort to reactivate the building. While we mainly focus on the changes in Providence it is important to mention the occurrences that are happening just outside the city. The PawSox are moving to Massachusetts. This has shifted the outlook of investment in the downtown area of Pawtucket. There are a few big questions; what will happen to the Apex building? Should the state help with investment? People who live and work around the existing ballpark have a growing concern as to what will become of the ballpark, hoping it won’t end up being an “empty hole”. The city currently is attempting to work with the ownership of the property to determine the best development plan for both the site and the city. This redevelopment along with the new train stop coming in 2020 and the proposed Conant Thread District should help to reinvigorate both downtown Pawtucket and Central Falls and hopefully help the next generation of new business that were hoping for new retail, restaurants, hotels and volume of people the stadium would have brought to the downtown area. In conclusion most signs are positive in the market but we, as always, remain cautiously optimistic. The national and state economies continue to expand but the future shows increasing lending rates which will impact activity. We hope to avoid the “first in, last out” scenario that has historically impacted the state and there are many good indicators including lack of inventory and decreasing vacancy that we will. But without more robust development of product we could slide back. 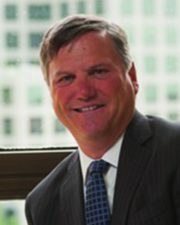 Thomas Sweeney, SIOR is president of Sweeney Real Estate & Appraisal, Providence, R.I.